Hello business owners! This is podcast #70. Since it’s Friday, I thought it would be good to talk about what I’ve learned this week. “Always be learning”– I think that is a very important strategy. There are many others, such as “always be testing”, “always be this, always be that”. I don’t like the one “always be selling”. You can always “be marketing”, but, more than anything, you should always be learning, and by learning, I just mean listening. Listening for little nuggets from people that you can apply to your business that can help you. That doesn’t cost anything. I follow James Wedmore, who is a fantastic YouTube strategy guy. He has done very well with his business. He used exactly these methods that I describe here, so I listened to him. Strangely, I was listening to a podcast by someone else, when they were interviewing him. It turns out, that the person who was doing the interview, learned all of their business knowledge from James too. Just goes to show that his skills actually work. In one of his videos, he mentioned one little tactic that I instantly applied it to my fire business. He talked about the titles in your YouTube videos. In my fire safety business, we produce product videos each week. I just recently did one on a 2 kilogram powder fire extinguisher. Generally, the title would include those exact words, because we’d be aiming for the keyword and “2 kilogram powder fire extinguisher” is a keyword term. However, if you think about it, you don’t just want to know about that. You want to know something else about it, something specific. If you wanted to know old facts or the price or anything like that, you probably would just Google it, but if you’re in YouTube, you want to see something visual. So, we changed it to something different and asked, “How Big is a 2 Kilogram Powder Fire Extinguisher?” Imagine if someone is searching for information about that specific extinguisher. When they search, I might actually come up in that list of titles in YouTube. It’s a little bit more intriguing don’t you think? Those little snippets of additional modifiers and keyword search terms are going to make a big difference to our click throughs in our videos. That’s one thing I learned. This week, I also learned a lot about Facebook marketing from Amy Porterfield, another person that I follow. She shared how to get people from Facebook into an email list and to lead generation. She also uses LeadPages. It is a wonderful tool for lead capture. One little snippet that she showed us a demonstration on was how she sets up her Thank You page at the end. We use to use the plain Thank You page that is supplied by WordPress, but since then, we have changed up our lead page strategies and we now develop our own custom Thank You pages. Again, something you might not have been really considering when you started out, . hat’s why you keep going to the nth degree, because every little bit matters. Yesterday, I was at a strategic coach meeting. We have these meetings quarterly, and it is a good for my business. While I am at this meeting, people start asking me about this podcast that I do. As it turns out, I am the only one who does a podcast. A lot of other people have considered it, but, because it sounds very technical and too difficult, no one wants to try it. Trust me, I’m lazy. Remember, I’ve mentioned that a few times. If it is difficult very technical, I would not be doing it because I am not a very tech savvy person. But once you’ve tried something once, you realize how easy or difficult it is, and doing this podcast is not hard at all. Working with Itunes sounds quite complicated. They don’t actually do anything. They are an aggregator. You give them a feed of what you are doing, and they just automatically look at that feed and see what’s there. What I suddenly discovered this week is that, if I could get people into small groups, and talk to them and answer their questions, then I get a lot better response than trying to get my questions answered in a big crowd. So, I am going to possibly start creating some type of local marketing meet up. They will probably be in the London area, or maybe one in the Vancouver area when I am over there. I am also going to be adding into the free membership site a few free webinars as well as question and answer sessions because those are the types of things people are wanting. I’ve done this before in marketing, and people were very interested. I learn everyday. I want you to be learning too. These things you learn can be little snippets you pick out if you are reading a book. I have learned a lot from reading, and I try to write down what I am learning. So — what did you learn this week. 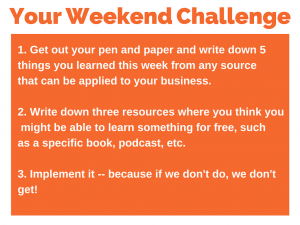 It’s time for us to start our weekend challenge. 1. 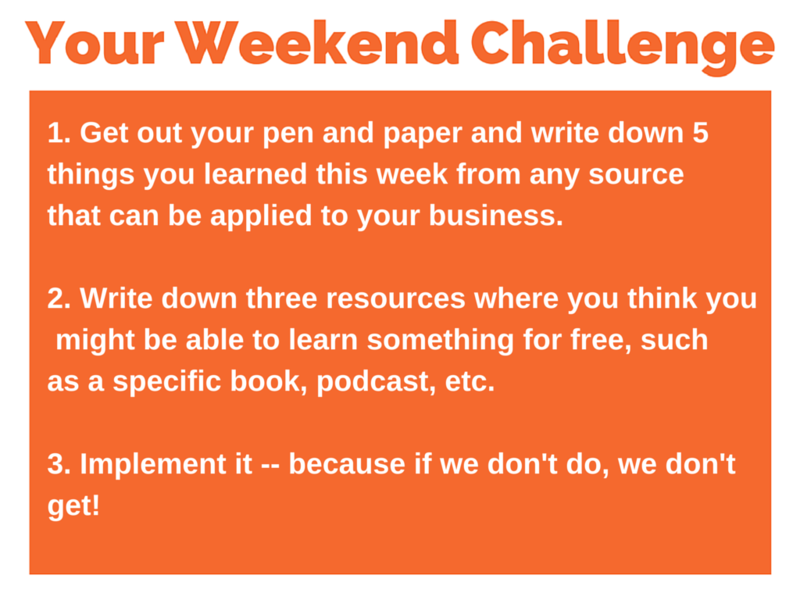 Grab your pen and paper and write down five things that you learned this week from any source. It could be from one of your staff. It could be from yourself or your business. 2. I want you to add three sources where you think you maybe able to learn things for free. As always this could be a book — and not just any book, but a particular book. If you are going to write down something you learned from a book, be sure to name the book. If you learned something from a podcast, name a podcast. Yes, you can include this podcast if you are learning from it — and if you are, be sure and give me a rating and a review. If you are learning something on social media, whether it be a LinkedIn group, a Facebook group, a Google+ community — whatever it is, write it down. 3. Implement it , because if we don’t do, we don’t get. 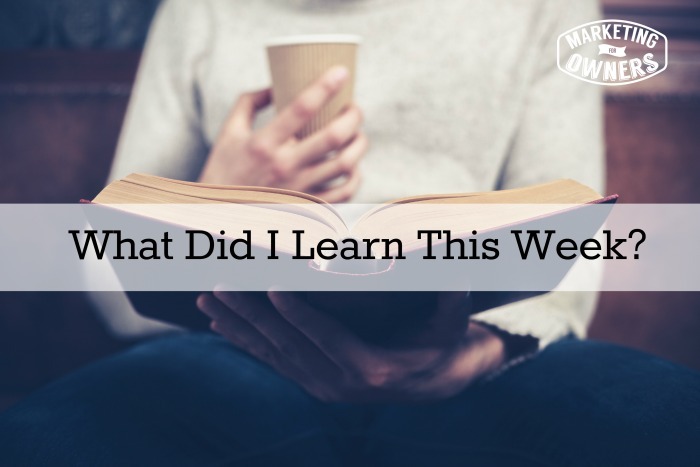 So — what did you learn this week?